PDF bookmarks provide a navigable table of contents and usually represent the chapters and sections in a document. Bookmarks can link to various locations in an open PDF file or even another PDF file. With AutoBookmark™ plug-in bookmarks can be automatically created based on text formatting styles, indentations and document contents of PDF documents. The plug-in has special features for formatting bookmark titles and controlling their visual appearance. AutoBookmark™ also provides a friendly interface that is easy to comprehend both for advanced users and beginners. Step-by-Step Tutorial: Bookmarking "By Example"
This is an advanced bookmarking method that automatically generates multi-level bookmarks from the text attributes such as font style, text size, indentation and/or text pattern. The software creates bookmarks from a matching single or multi-line text. The standard "Select Text" tool can be used to simplify bookmark level definition from text samples. The software scans pages of input PDF document and finds all occurrences of the matching text. The matching text is used to create bookmarks. The bookmarks are automatically arranged into a nested hierarchy based on user settings. More than one text style can be used to describe each bookmark level. The software supports partial matching on font names and styles. The ability to work with multiple font styles and text patterns sets AutoBookmark™ plug-in apart from the other available tools on the market. Click here to download a visual step by step guide to bookmarking by text style or watch YourTube video. The software provides a range of advance options that allow fine control over appearance, content and functionality of the bookmarks. Bookmarks can be modified by adding custom text before and after each title or by completely changing or re-arranging bookmark text. Text case can be automatically changed to fit a desired style. Automatically add or remove leading numbers of the bookmark titles. Use numbers, letters or roman numerals for title enumeration. The maximum length of the bookmarks' text can be limited to avoid long unreadable bookmarks. User-defined list of "stop words" can be used to excluded certain text from being bookmarked. The AutoBoomark provides a way to bookmark PDF documents using a user-defined list of search terms (step-by-step tutorial). Every or just first occurence of each search term is bookmarked at user-specified bookmark level. A variety of search options can be used including limiting a bookmark to a specific range of pages, matching optional page label, skipping duplicate bookmarks and etc. This function can be effectively used to bookmark table of contents entries in PDF documents including cases when physical page numbers do not correspond to printed page labels. This operation is also available as a batch command. Bookmark all occurrences of one or more text pattern in the PDF document using powerful regular expressions. This method allows bookmarking of complex PDF documents that are otherwise hard or impossible to bookmark. Regular expressions are used to describe text patterns that have a common structure but are too numerous to enumerate. This method can be used to bookmark chapter titles, product SKUs, phone numbers, emails, web addresses, account numbers and other text patterns that typically occur in legal or business documentation. Contact our technical support if you need help on using this feature for a specific project. Here is a link to a step-by-step tutorial that illustrates how to create multi-level bookmarks by using text patterns . Quickly add bookmarks based on existing table of contents. Simply select desired entries and press a button. The software allows specifying the page offset between printed numbers and physical page numbers in the current PDF document. Automatically convert links in the PDF documents into interactive bookmarks. The plug-in converts each occurrence of the link annotation into a bookmark. Text covered by a link annotation is used as a bookmark title. Bookmarks will have the same actions as corresponding links. This operation provides a quick way of converting a hyperlinked table of contents into a set of interactive bookmarks. Tab leaders, page numbers, extra text lines, or duplicates spaces can be optionally removed from the bookmark titles. Automatically create bookmarks from notes and comments. Many types of commenting and drawing annotations can optionally have text comments attached. The plug-in scans a PDF document and bookmarks all locations of such annotations. The text content of the comment is used for the bookmark title. The bookmarks will point to the locations of corresponding annotations. Bookmark color can be optionally inherited from the originating annotation. There are options for removing duplicate spaces and extra text lines from bookmark titles. Easily bookmark all text markup in the document. The plug-in can bookmark locations of every instance text highlight, underline or strikeout. Text behind each annotation is used for a bookmark title. This procedure provides a great interactive way of adding bookmarks to the document while reading it. Simply highlight all the text that needs to be bookmarked and press a button to create bookmarks out of the text markup. Named destinations are often used to define navigation paths across one or more PDF documents. A named destination is a combination of a text label (name) and a viewing area definition (such as page number and zoom type). Bookmarks can be easily created from existing "Destinations" records. Each bookmark is gets the same title as the corresponding named destination and uses it to define its action. Use “Create Bookmarks From Text File” operation to import bookmarks into multiple documents by matching PDF documents with corresponding text files with bookmark definitions. For example, use this feature to automatically import bookmarks from Chapter1.txt into Chapter1.pdf, Chapter2.txt into Chapter2.pdf and so on. This functionality is available via Acrobat’s Action Wizard tool for batch processing and requires both AutoBookmark Pro and Acrobat Pro. Make large PDF document collections easier to navigate with a common set of navigational bookmarks. Bookmarks are automatically created to point to each file in the collection. Simply click on a bookmark to open another document in the collection. It takes just few seconds to turn a large unmanageable collection of PDF files into a perfectly interactive and navigable “binder” ready to be placed on a CD/DVD or published online. Automatically add bookmarks to selected files (any kind) or all PDF files in the selected folder (including sub-folders). New bookmarks are created by using file and folder names as bookmark titles. Each bookmark is assigned a "relative path" to link to a target file (using an "Open a file" action). The plug-in provides a variety of options to control the visual appearance of the bookmarks and the way external files are opened (in a new window, in the same window or using preferences). Easily link existing bookmarks to external files of any type. The Adobe Acrobat does not provide a good interface for a quick linking of multiple PDF bookmarks to external files. The process is slow and requires a lot of mouse clicking and opening of several dialog windows. This plug-in provides an easy to use interface that requires a minimum number of clicks to link a PDF bookmark to a file. All "document" file types can be linked. Automatically bookmark every Nth page in the document. Bookmarks can be generated just for a selected page range or for the whole document. Bookmark titles can be customized to include page numbers, page labels, first line of page text and etc. This is the easiest method to add bookmarks to unstructured documents. Create a list of frequently used bookmark titles and use it to quickly bookmark pages. This is a time-saving tool for those cases when none of the automated bookmarking methods can be used. If a set of PDF documents has several similar sections that need to be repeatedly bookmarked with the same bookmarks, then this tool can provide a list of bookmarking “shortcuts”. Easily expand or collapse all bookmarks in the document or just bookmarks at specific nesting level. Use the plug-in to append each child bookmark title onto its parent bookmark. Every child bookmark is appended in the same order as it is listed in the bookmark tree. Optionally, a custom separator is inserted at the end of the parent’s title before appending each child bookmark. The default separator is a space symbol. Select bookmarks based on title text and other attributes to apply a wide variety of editing operations. Selected bookmark levels, bookmarks and their children can be duplicated, deleted, stripped of actions, expanded or collapsed, their appearance modified, moved one level up and etc. Bookmarks are selected by performing a text search (regular expressions are supported) and further filtered by their attributes such as presence of actions, types of the destinations, and presence of child bookmarks. This operation provides a powerful and flexible mechanism for managing existing bookmarks in PDF documents. Bookmarks can be sorted alphabetically in ascending or descending order. Individual bookmarks or whole bookmark levels can be sorted separately. Bookmarks can be sorted by referencing page numbers in ascending or descending order. Individual bookmarks or whole bookmark levels can be sorted separately. Existing bookmarks can be automatically validated by verifying their actions. Destination pages are checked to make sure they are referring to valid page numbers. External links are verified to make sure they are pointing to existing files or documents. The automatic validation procedure also catches other common problems such as missing titles or bookmarks with no assigned actions. This operation can be also executed in the Acrobat batch processing framework. Validation results are written to a text log file (sample log file). Spell check bookmark titles in the currently open PDF document. Correct problems either automatically from the list of suggestions or by manual editing. Sort document pages based on the bookmark order. Pages that appear first in the bookmark tree will be moved to the beginning of the document. The plug-in correctly handles page ranges (no need to bookmark every page) and quickly arranges pages into the desired order. Easily duplicate existing bookmarks including all child bookmark entries. The duplicate bookmarks retain all properties of the originals including action and visual appearance. Consecutive bookmarks with identical titles can be merged into a single bookmark with their child bookmarks consolidated. One or more bookmark levels can be merged recursively. The bookmark tree can be “inverted” from bottom to top in such way that lower bookmark level becomes top one, and etc. Swapped bookmark tree is added to the end of the existing bookmark hierarchy. Optionally, top level bookmarks (in the swapped bookmark tree) with the same titles can be merged together and their child bookmarks combined under a common bookmark. This operation has been specifically developed to support FDA's requirements for case reports. Copy bookmarks from another PDF document to a currently open document or copy all bookmarks from a current document to a set of PDF files and folders (all PDF files in a folder are processed). Bookmark actions (hyperlinks) can be adjusted to point either to the locations within the source PDF document or converted to the same locations within a destination file. Bookmarks can be inserted before, after or in place of existing bookmarks. This powerful option allows a free transfer of bookmarks between documents. This operation is useful when a set of common pre-defined bookmarks needs to be added to a new document(s). Bookmark titles can be searched for occurrence of a specific text string and replaced with new text. The software provides the option for case-insensitive search and Unicode encoding. Regular expressions are supported. Automatically add leading numbers to bookmarks using any combination of digits, letters and Roman numerals. Easily add text before and after existing bookmark titles (prefix and suffix). Processing can be applied to one or more bookmark levels at once. Insert page numbers, Bates numbers, named destinations, bookmark levels, web addresses and file names that the bookmarks are refering to into bookmark titles. The software provides functionality for inserting Bates numbers into existing bookmark titles. If a bookmark points to a page that has an assigned Bates number, then it is possible to extract it and insert anywhere in the corresponded bookmark. Change zoom type for all bookmarks in the document to one of the following: "Fit Page", "Fit Width", "Fit Visible", "Inherit Zoom", "Actual Size", "Custom View" or "Custom Zoom". This operation only affects bookmarks with "Go to a page in this document" and "Go to a page in another document" actions. Here is some helpful information about a very popular task of converting bookmarks to use "Inherit Zoom" zoom type. Automatically convert bookmark text to uppercase, lowercase, sentence case or title case. The plug-in provides the ability to specify a list of custom words that should not be capitalized when converting to title case as well as the option to not capitalize certain words such as "a,an,and,as,at,but,by,e.g.,e.g,etc...". Convert bookmark actions to use "named" destinations instead of direct references to a page. Destinations are automatically generated from existing bookmarks. Named destinations enable you to set navigation paths across a collection of PDF documents. Linking to a destination is recommended when linking across documents because unlike a link to a page, a link to a destination is not affected by the addition or deletion of pages within the target document. Named destinations can be also shared between multiple links or bookmarks within a document. For example, instead of using a direct link to page 10, a bookmark will point to the named destination "Chapter 1" . You will be able to link to this location using a human-readable name instead of a page number. Convert "Go to a page in another document" and "Open a file" actions to "Open a web link" actions. This operation can process both bookmarks and link annotations. Use the plug-in to print bookmarked pages or whole page ranges defined by consecutive bookmarks. Each bookmark is shown with a corresponding page range appended to the title (“Pages X to Z”). Use these page ranges as a guidance while selecting bookmarks for printing. Page ranges can be printed as one printing job or as separate printing jobs for each page range. Print bookmark titles on the pages that they are referring to. Choose font, size and color for the output text as well as the position on the page. Bookmarks can be exported to a plain ASCII text file format (sample output), HTML file format (most bookmark actions are preserved in hyperlinks) or an XML document. Most bookmark attributes are exported into both text and XML format: title, destination page number, indentation, style, color, associated action type, destination view, zoom factor and external file references. Titles are properly indented to reflect parent-child relationships between bookmarks. HTML output preserves most common bookmark actions as HTML hyperlinks and can be used to create a web index to PDF documents. All bookmarks can be quickly deleted from the document with just one mouse click. Use "Find and Edit Properties..." menu to delete only a selected level of bookmarks while keeping all child bookmarks. Users of Adobe® Acrobat Professional® (for versions 6 and up) can use Action Wizard (also known as batch processing) to automate many bookmark and link-related operations. AutoBookmark™ Professional adds most of its functionality as batch commands to Action Wizard to allow processing many documents at once. Use these operations to automatically extract bookmarked pages or pages with comments or highlights into a separate PDF document. This operation automatically transfers bookmarks into a new document to make sure they are operational and can be used for navigation. The software is available in two product levels: Standard and Professional. 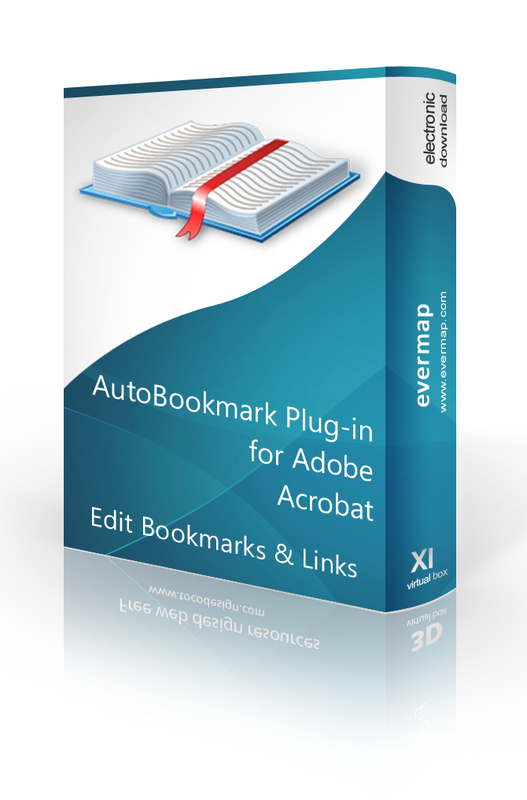 Both levels have identical functionality except batch processing support (batch processing commands for: bookmarking, linking), that is available only in AutoBookmark™ Professional plug-in. All other features, menus and toolbars are the same. Microsoft® Windows Vista/2003/2008/2012/Windows 7/Windows 8/Windows 8.1/Windows 10. Full version of Adobe® Acrobat® software is required (versions 6, 7, 8, 9, X, XI, DC, 2017). This software will not work with free Adobe Acrobat® Reader®. Batch processing functionality requires presence of Adobe® Acrobat Professional®. (Adobe Acrobat Product Comparison Chart).